Horticultural Shadecloth is primarily designed for use on shadehouses and nurseries but is equally suited for use as vehicle hail protection, livestock feed lots, shade sails or other applications that may be subject to tension. 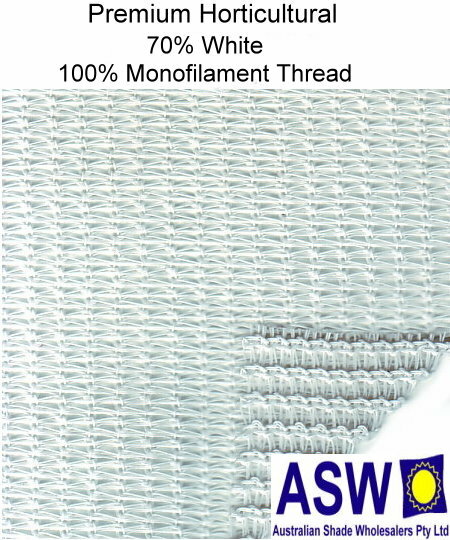 This high quality, monofilament knitted shadecloth, is manufactured from UV Stabilised HDPE using a knitted construction with a heavy duty Monofilament thread and is physically stronger then Domestic Shadecloth. The 100% Monofilament thread construction ensures a more accurate and even shade protection for plant enthusiasts.. Independent tests ensure compliance with Australian Standards for shade & strength levels.